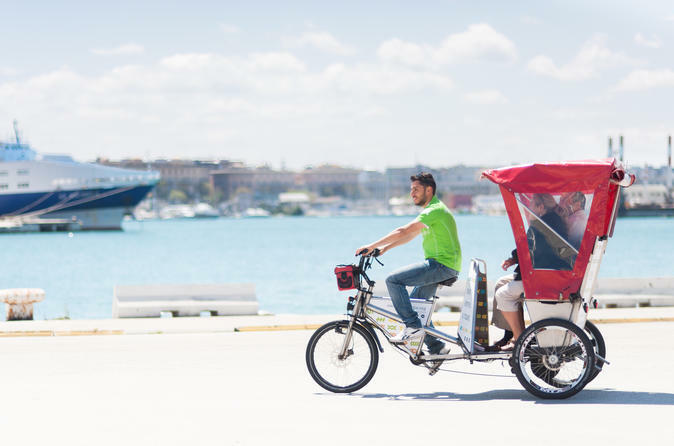 Enjoy an alternative sightseeing experience of Bari on a private 3-hour rickshaw tour of the coastal city. Select a departure time to suit your schedule and then allow a private guide to show you Bari’s historical and architectural highlights. Listen to illuminating commentary as you navigate the ambient tangle of Bari’s Old Town and admire impressive monuments like the Basilica di San Nicola and Bari Cathedral. Receive the undivided attention of your guide on this private tour, the itinerary of which can be adapted according to your interests. At a time and location prearranged with your private guide, climb aboard your rickshaw and embark on a comprehensive sightseeing tour of Bari. Receive an insightful introduction to the city from your knowledgeable guide and wind your way through charming streets replete with quaint churches and enticing cafes. Let your guide lead you to some of the city’s most popular foodie hotspots to sample local specialties like gelato or bruschetta smothered with tomatoes and salty olives (own expense). If you’d like to stay longer at certain attractions, simply inform your guide who will adapt your itinerary accordingly. Bid your private guide farewell when dropped back at your Bari hotel.